* High-Tech Fabrics is so Therapy- Made of IBAMA's unique patent fabrics, excellence in keep warmth and increase blood flow as well as microcirculation in knees. Protect your knees and relieve knee pain from symptoms like strains, sprains, rheumatism, and arthritis and so on. * As Flexible as a second skin- 3D seamlessly knitted sleeve pre-set various weaving way in different parts to meet their unique requirements of compression force. Four-way stretch with added support and coverage make it great for running, climbing, cycling in all seasons. * Stay Warm as well as Stylish- Feel spry and easy with this snug, sweat-wicking knee sleeve. It is so close-fitting, thin and lightweight that is barely-there when wearing under clothes. Perfect in keeping people warm as well as stylish in a less bulky way in winter. * Light, Skin-friendly and Breathable- Breathable knit fabric is ideal for even the allergic skin and removes excess perspiration for all-day comfort and dry. A silica gel in front to keep it stay in place and won't slip down. Wear it to sleep every night and you will find your knees are so warm and health. * A Gift that Everyone Likes - What's better than practical knees sleeves that are so warm, cozy and relieve knee pains? It combines versatile, practical, and easy that satisfy your gift recipient's need to do sport, go leisure or just do therapy. Also, your favorite people will use time and time again. Did you hurt your knee or suffer rheumatism, arthritis? Or feel locked and restricted with those unsatisfied gear? Either way, you might want something that can warm your knees, supports your muscles and relieve your pains, swelling, and stiffness, at the same time move your joint around. And this is why we designed this therapy knee sleeve with good warmth keeping and support. Can you imagine that there is some fabric that can retain heat and increase blood flow and oxygen? And our high-tech patent fabric can do this. IBAMA work together with professionals developed this new patent fabric. It is excellent in boosting circulation, relieving inflammation, and reducing pains. Thus promote faster recovery from injury, rheumatism, arthritis or any disease caused by cold and help prevent further injury. If You Live An Active Life That Doing Sports Regularly, Then You Need This! Did your knee join to overload constantly? Can you feel bursitis and cartilage wears is approaching? Think jogging, hiking, and other gym sports that involve a lot of jumping and landing, they all tend to overload your knees every day. Having a good knee sleeve is extremely urgent. 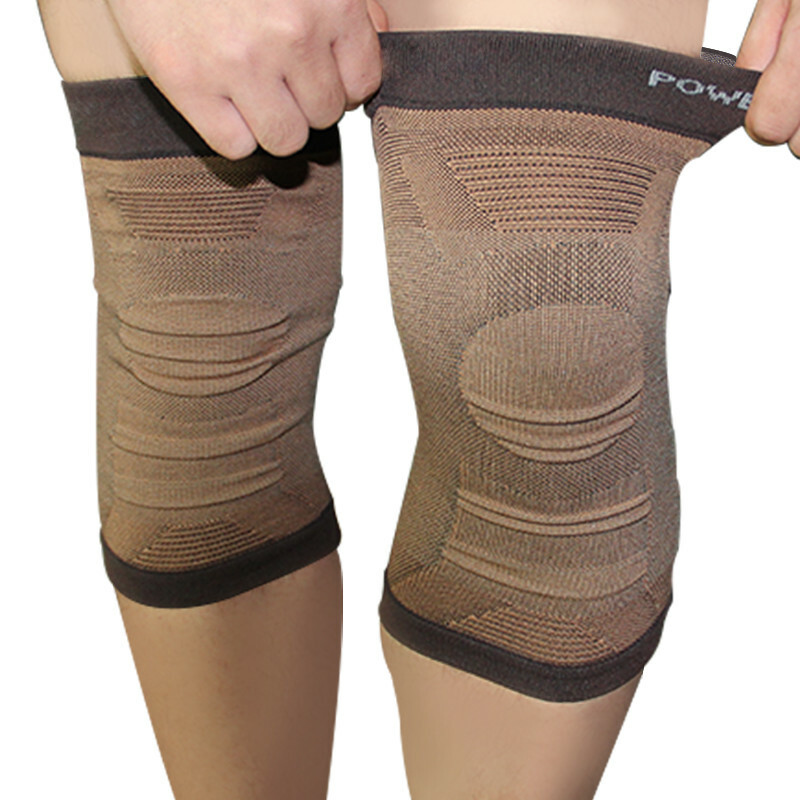 IBAMA enhance excellent performance in offering support and compression to the knees and ligaments. So you'll be running faster, longer, and healthier. If you're a fashion lady looking for something that makes you look slim but also keep warm, then this is it! IBAMA Ergonomic Knee Brace follows the contours of the kneecap and popliteal providing a well but not squeeze fitting that is perfect to wear under the dress, the long coat and trousers to suit whatever stylish. This moisture-wicking and anti-pill knee sleeve will also keep your body heat at the same time smelling fresh and clean. This Is What You Really Can Do For Your Parents! Have you ever noticed it? Your parents are trapped at home in cold days, some of them, even tossing and turning at night from the knee pains. They were running enthusiast when in young, they once had easy of movement joint, and they were strong enough to against the cold weather before. But as age, most of them suffered by the knee problem. Maybe we cannot spend too much time to massage them every day, or we can't afford those very expensive medical instruments. But buying an IBAMA Heating Knee Brace, all of us can do it. For our parents' health, to keep their knees young ready for the next starting line.